To deliver a good film, it's not always necessary to go big. Sometimes, you just need a great performance on show, in one location. It worked for Colin Farrell in Phone Booth and Ryan Reynolds in Buried, and now, it's also worked for Blake Lively. Shortly after the death of her mother, Nancy (Blake Lively) travels to a secluded beach in Mexico (The same beach her mother surfed at upon discovering she was pregnant with Nancy). While surfing, she is attacked by a great white shark, getting stranded 200 yards from the shore with a large bite wound on her leg, and a wounded seagull for company. Much like Jaws, the picture proves more effective when we don't see the shark. While this is due to a significant rise in intensity and thrills (both effectively delivered by Jaume Collet-Serra), this is also because the effects for the shark are glaring and poor. While Spielberg's classic used practical effects to showcase their creature, there's no such luck here, resorting to wonky looking CG work. The final act disregards the thriller elements, to instead focus on poorly rendered action that feels taken from an entirely different picture (matters aren't helped by the weak effects work, which resembles that of a Syfy Original Movie). A film like this ultimately rests on its lead performance, and frankly, Blake Lively kills it. She delivers a bravura performance, perfectly selling the terrifying scenario she's become a part of. But it's also the calm before the storm she gets across well, as her character feels lost on what to do, still recovering from the loss of her mother. Praise is also deserved to Sully, who delivers one of cinemas best Seagull performances (and of course he gets named Steven). 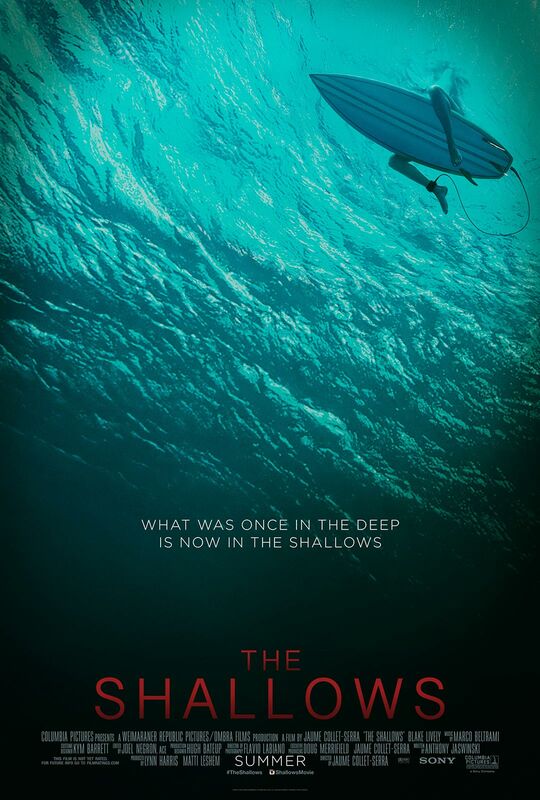 The Shallows effectively delivers white knuckled thrills, while proving a perfect showcase for Blake Lively's talents. Sorry to bring up her husband, but this is her Buried.